Canada’s High Performance Director John Atkinson has a full roster for the 2016 Olympic Games that he’s happy with moving forward as the games approach. 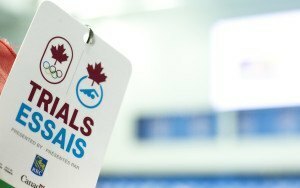 Hilary Caldwell waited until the last day of the 2016 Canadian Olympic Trials in order to make the team, securing her spot with a first place finish in the 200m backstroke. 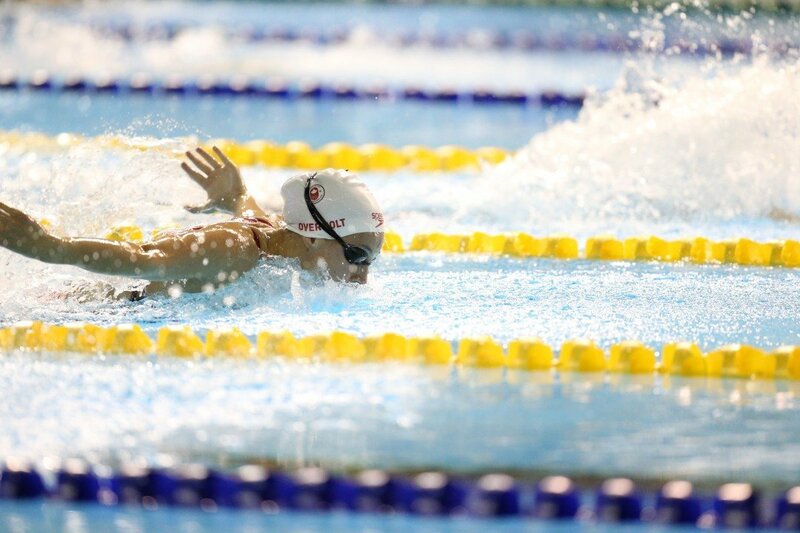 Dominique Bouchard made her mark on the backstroke events last week at the 2016 Canadian Olympic Trials, finishing second in both the 100 and 200 and solidifying her spot on Canada’s Olympic team. Chantal Van Landeghem had a very successful run at the 2016 Canadian Olympic Trials which qualified her to compete at her first Olympic Games ever. Sandrine Mainville was one of the five High Performance Centre – Ontario athletes who qualified to compete for Canada at the 2016 Canadian Olympic Games last week at the Canadian Olympic Trials. 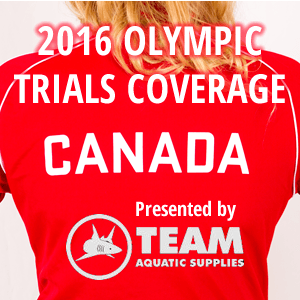 After a sizzling opening night of action at the Canadian Olympic Trials, we are set for day two prelims this morning. This mornings action includes the men’s 200 fly, the women and men’s 100 back, and the women’s 400 IM. After two Canadian record performances on the women’s side last night, the events today will once again highlight the strength of this women’s team. The 100 back is loaded, featuring seven women seeded under 1:01, while the 400 IM features last years World Championship bronze medalist Emily Overholt. After the men went 0 for 3 last night in making the Olympic qualifying standard, they’ll have a good chance of getting a couple men on the team tonight. Both Zack Chetrat in the 200 fly and Russell Wood in the 100 back are seeded under the FINA-A standard. Nicolaas Dekker is the surprise top seed for tonight in the men’s 200 fly after posting a time of 1:59.35 this morning. Dekker chopped over a second a half off his previous best time to claim 1st this morning. 2nd went to Coleman Allen in 1:59.39, which is also a best time. Dekker and Allen both broke two minutes for the first time this morning, and they were the only two to do so. Mack Darragh will be seeded 3rd for tonight after going 2:00.56 this morning. Darragh boasts a best time of 1:58.52, so look for him to be under two minutes tonight. The man with the best shot at getting under the FINA-A standard of 1:56.97 didn’t have the best swim this morning, as top seed Zack Chetrat was just 6th in 2:01.84, well off his best time of 1:56.90. Chetrat will need to be much better tonight in order to make the Olympic team. This event was loaded with international swimmers. 2015 World Championship bronze medalist Jan Switkowski led the way posting a time of 1:57.01 this morning. He was followed by Mick Litherland (1:58.06), Michael Klueh (1:58.55), and Michael Flach (2:00.55). Those four will contest the B-final tonight. Among the international swimmers not moving onto the B-final was American Tom Shields, who was the 6th best non-Canadian in 2:01.09. Only the top-4 foreigners can swim in the B-final. 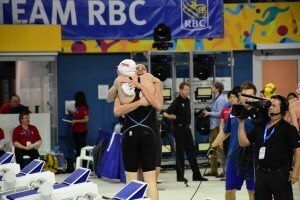 Kylie Masse of WEST came in and dominated the women’s 100 back prelims, touching in a new Canadian record of 59.17. 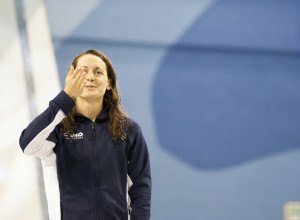 The previous record belonged to Sinead Russell at 59.68 set at the 2011 World Championships. The swim also moves Masse up from 11th to 5th in the world since the 2015 World Championships. Second went to Dominique Bouchard in 1:00.43, and third was Alexia Zevnik in 1:00.98. 200 back specialist Hilary Caldwell was 6th in 1:01.27, and former 50 back national record holder Brooklyn Snodgrass was 7th in 1:01.50. Masse looks like a lock right now, and it will be up to the other women to battle it out for the 2nd spot and try to get under the qualifying standard of 1:00.25. A surprise this morning was Taylor Ruck, 4th place at the 2015 trials but just 17th this morning in 1:02.85. Russell Wood defended his top seed in the 100 back, coming in at 54.87 for 1st place. Wood will need to get down under the qualifying standard of 54.36 tonight if he hopes to qualify in this event. His best times is 53.96. 2nd went to Javier Acevedo in 55.14, taking a tenth off his personal best time. They were followed by Jeremie Dezwirek (55.28), Rob Hill (55.57), and Markus Thormeyer (55.75). It will be interesting to see what tonight brings. Wood looks good for the win, but can he get under the 54.36 qualifying standard? Acevedo is definitely a racer, and could very well dip into the 54s tonight, as could Thormeyer who already won the 200 free at this meet. Ryan Murphy led the way on the international side, clocking 53.66. He was followed by Cal teammate Jacob Pebley (54.08), Corey Maine (54.27), and Dylan Carter (54.94). All four will swim in the B-final tonight. Sydney Pickrem from Island Swimming took the top seed in the women’s 400 IM in 4:46.86, just ahead of Erika Seltenreich-Hodgson of the GO Kingfish who was 2nd in 4:47.40. Pickrem won this event at the 2015 trials in 4:39.26, and then lowered her best time again at Pan Ams going 4:38.03 for silver. Top seeded Emily Overholt seemingly cruised the prelims, placing 3rd in 4:48.33. Expect her to be much closer to her personal best of 4:32.52 tonight. The Olympic qualifying standard of 4:43.46 is well within reach of all of the top-3 women, as they have all been well under 4:40. Marni Oldershaw took the 5th seed in 4:49.73, and Sarah Darcel was 5th in 4:50.10. American Elizabeth Beisel put up a very impressive time of 4:35.82 this morning, setting her up well for the consolation final tonight. 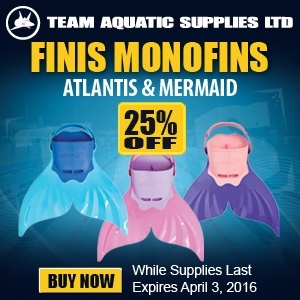 Any live feeds available outside of Canada? No unless you go through something like VPNGates. That’s what I do and it works fine! That’s what happens when the CBC gets involved. There were wall to wall live feeds from CIS.